June 2017: Howard Moody, Emily Blows and Ken Aiso spent four days working with older adults with dementia in Salisbury District Hospital. 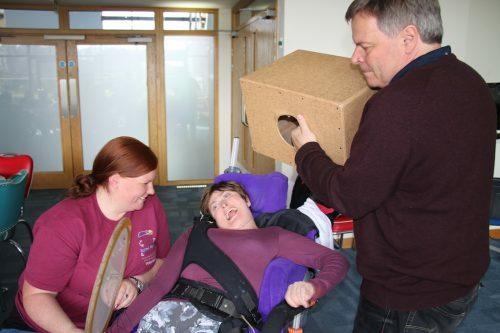 Drawing on patients’ memories and current experience, they created music with individuals who were assigned to them by the medical staff, exploring their responses and documenting outcomes. In some cases, patients chose to simply hear the musicians play and sing to them. One patient’s family member described the music as “a real blessing”. March 2017: Howard Moody and Emily Blows led sessions with patients, parents and carers at Jacksplace Hospice for young adults, creating words and music for several songs. One young man had a strong alto voice. He had not sung since leaving school and had come to Jacksplace only recently, which he said had changed his life. Within minutes he was singing, composing a song, saying he had been longing to let that out for ten years, and thanked Emily for “giving me back my voice”.